You all know about my affinity for brownies by now. You may also know how I love to dress up a chocolate chip cookie - my other longtime love. Throw in a generous handful of sprinkles and you have one happy cookie. How could it not be happy? After all, aren't we all happy when stuffed to the brim with brownies, chocolate chip cookies and sprinkles? Indeed. In a large bowl cream butter and sugars until fluffy. Add vanilla and eggs, mix. With mixer on low add in flour, soda, and salt and mix until well blended. 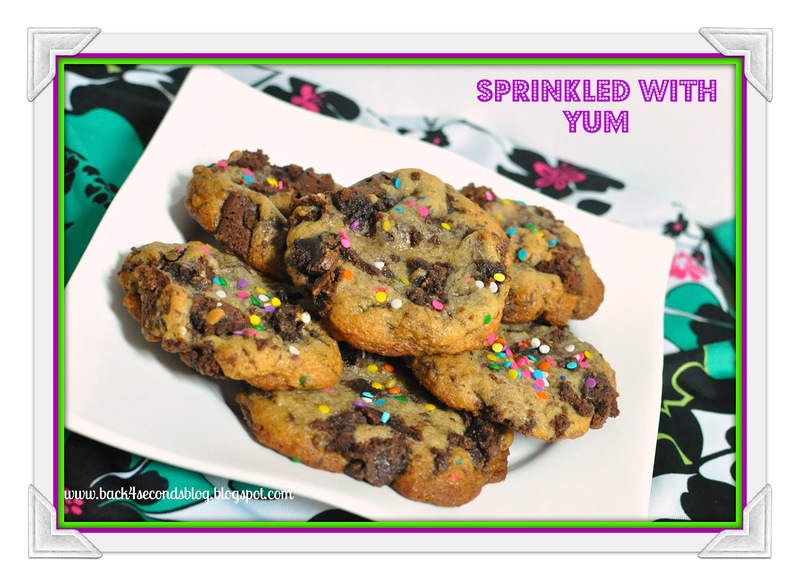 Stir in chocolate chips, sprinkles, and chopped frozen brownie pieces. Scoop dough by 1/4 cup scoops onto on ungreased baking sheet at least 2" apart. Bake for about 10-12 min. Cool on wire racks and store in airtight container. I'm drooling just reading the recipe. Yum, yum! Um...yeah, these sound really good. This is awesome. Genius, actually. I never thought to add chopped frozen brownies to chocolate chip cookies, but then again, what can't you add to cookies?! Obviously I need to make me some brownies, resist the urge to eat every last crumb, and stuff them in some cookies because these are the bomb. So. Amazing. Will you be my BFF? Oh my. Every time I think you can't possibly come up with something more amazing, you do. OH MY GOLLY! Who knew? I'm totally making these. It's the best of both worlds! YUMMY these look so good. I must try them out. Oh how I love love love your thinking! These would be such a special treat...definitely an UPPER, especially for a downer kind of day. WOW! Thanks so much for linking up at Weekend Potluck. We would love for you to link back to us so we could possibly use this, and others as well, as a feature. I must be dreaming because these cookies look out of this world! I love combining two desserts into one... brownies + cookies, can can you go wrong? So creative! Sounds yummy! I am also a big fan of brownies and chocolate chip cookies, so this right up my alley. This sound so fantastic. I love brownies; I love cookies. What could be better? I am your newest follower. I hope you'll stop by and check me out sometime. And btw, I am totally PINNING THIS! I'm planning to make brownie-stuffed-cookies for sometime now. These look amazing! I shared on my facebook page. Thanks so much for sharing at Whimsy Wednesdays! Oh my! Sounds heavenly! Pinning!!! This is the cookie version of the best ice cream EVER - Ben and Jerry's Half Baked (half vanilla with cookie dough, half chocolate with brownie bits)! I am dying over here. DELISH!!!! This was such a wonderful post. I would love it if you would share this at our WIW linky party. I hope you can join. How smart are you? My daughter is doing a cookie bake sale every week and these just made it on her must make list! Pinned, thanks for sharing! These look AMAZING. Two of my favorites combined! New follower, can't wait to see more of your yummy stuff!!! These look so delicious. 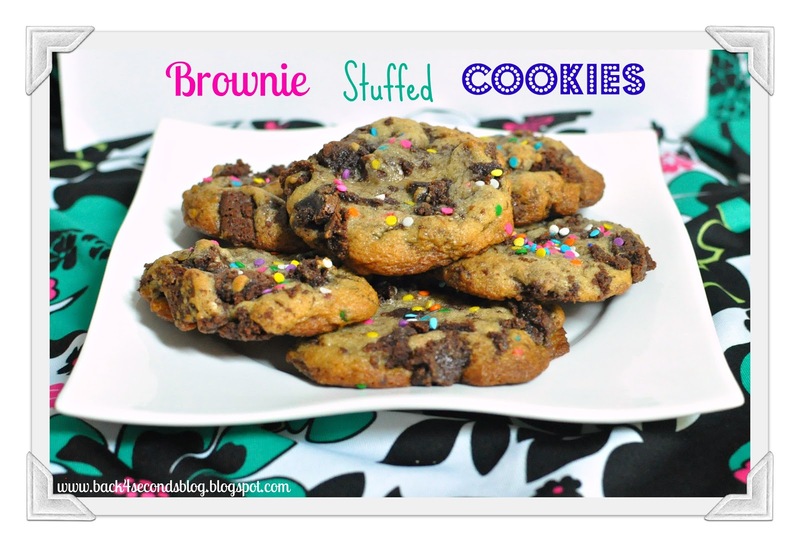 I love that I can have brownies and cookies combined! Thanks for sharing at Showcase Your Talent Thursday! These have got to be the world's greatest cookies!!! Love them, love them, love them! !